Order in next 3 hours and 53 minutes for despatch today. 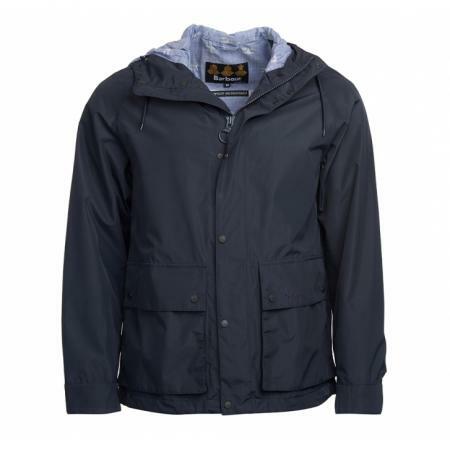 Barbour Twine Waterproof Breathable Jacket in navy blue. Styled for a rugged, nautical look, the Barbour Twine Jacket offers reliable waterproof functionality with a generous hood and a lightweight mesh lining for breathability. The front zip fastening sits behind a stud-close placket, while two lower patch pockets feature side entry for added practicality on the move. The iconic Beacon print makes an appearance on the lining, a nod to Barbour's maritime heritage. •Barbour branded tonal embroidery to left pocket flap as worn. •Back length: 29-33in / 73.5-83.5cmSALE!